Yeah, notice the time. Just got done a little while ago skinning and deboning. Hunted pretty much all day Saturday. 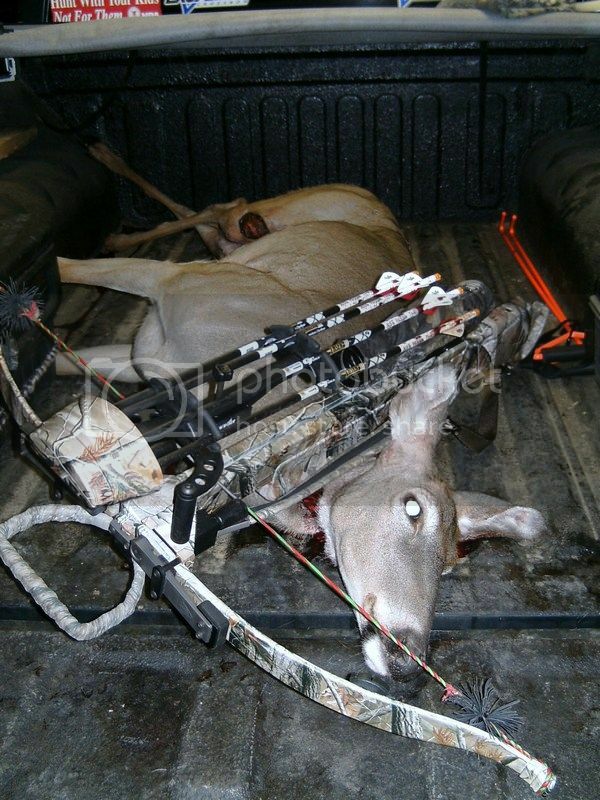 Had a screwy ESE wind, so I had to hunt on the ground in the morning to get the wind in my favor. Didn't see anything though. Switched to another place around 11:00 AM and hung my climber (had to find me a new tree with the wind the way it was). Sat there until dark. Had 3 big ol' gobblers come in sometime, but never could get a shot at any of them. I had been getting pictures of a decent sized doe with 2 little ones and I had vowed to make her babies orphans. All 3 of them came in right at dark. Picked out the momma and unleashed the Excalibur Equinox! She was angled a little more than I thought so I didn't get the best hit in the world. At first it looked good, but when I took up the track half an hour later, I jumped her up. Backed out and went down to the truck to get a better light. Went back after about an hour and found 3 spots of blood and that was it. Looked and looked, but couldn't find anything. At that point, I just started looking for the deer and still looking for some blood. 3-4 times I "smelled" the deer and knew she was around there somewhere. After about an hour, I finally found her. I hit one lung, the liver, and the arrow had exited, slicing her knee on her back leg and disabling that leg on the opposite site. Though my shot wasn't perfect, the Swachers definitely made the difference on the shot with the 2.25" cut diameter. Got back up here a little after 12:00 AM. Didn't take any pictures in the field because it was dark and I was by myself. Got some in the truck but haven't downloaded them off the camera yet. I'll do it after I get something to eat and get some sleep! 95 lbs and 2.5 years old. Tough going, BC! But you got her! That doe should be great eating. I'm surprised she lived as long as she did, it wasn't actually that bad of a hit. Those quartering away shots are really tough! Actually, it was a quartering to shot. Pictures My jerky and trail mix at noon yesterday were long gone by 6 AM this morning, not to mention having gotten up at 3:45 Saturday morning. Feel much better now after a little food and sleep. I've actually got 1 more doe tag left, but I doubt I'm going to fill it. From what I've been seeing on the camera, there just aren't that many deer down there. Other than the momma and 2 little ones, I've been able to identify 2-3 other does that I've gotten pictures of. My brother has yet to start hunting. Figure I better save some for him. He's mainly a buck hunter, but will usually take a doe later in the season if he hasn't gotten anything. You can see the entrance hole in the picture of her hanging. I've been trying to play everything back in my mind and I don't know if I just didn't notice the angle she was at or if she turned a little just as I shot. I think she must have started to turn because the shot was a couple inches further back than where I was aiming. At 23 yds, my scope is pretty well on. Gotta love those Swhackers! 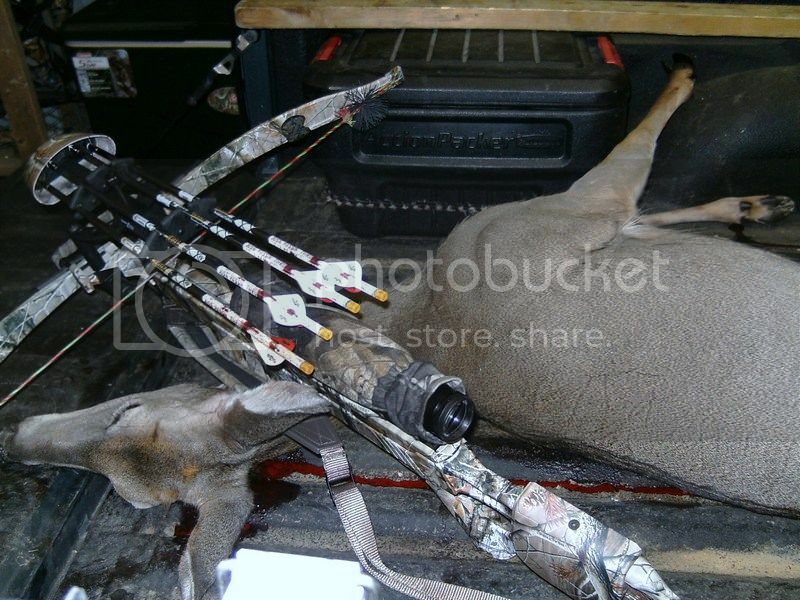 The first doe I got and the buck, it looked like you were sloshing blood out of bucket. This one, she didn't drop any blood hardly, but her inside was full. They definitely made the difference on the hit. Nice job BC That quartering-to shot is risky, but you and the swackers made it pay off. Also impressive are your tracking skills, who taught you to do that, Bo or the old injun ?? Whichever, you certainly got it right. I sure wouldn't want to have to track in those circumstances. I bet you could do that in a down-pour. The angle she was at when I shot, it wasn't that bad. I aimed tight in on her shoulder, knowing the angle would get the back part of the far lung. My hit was a couple of inches further back from where I was aiming and the arrow came out right in front of the far back leg, clipping the tendons at the knee. As for the tracking, my uncle taught me quite a bit, but the majority I've picked up on my own. Even if I have a deer go down in sight, I'll follow the trail to see what it does. Other times, I work backwards from the deer to see what all happened and where I went wrong or lost the trail. Getting plenty of practice helps too. When I was searching around with the flashlight and I smelled the deer, I took note of which way the wind was blowing and that helped narrow things down. All 3 spots of blood were in one spot, in the bottom of a hollow, going up and down the hollow. I had already searched up and down the hollow and the sides were too steep for anything to climb out of going up or down. Went and stood at the blood I had and figured out where the most likely place the deer would have gone was and started going in that direction. Finally got to where I couldn't smell the deer anymore and figured I was upwind of her so I started criss-crossing back and forth working my way downwind. You done good, BC! Good job tracking, had to be a tough tracking job. Wasn't really much "tracking" to it, unfortunately. She just didn't drop any blood. Where the arrow exited pretty far back, part of her intestines came through the hole and plugged it up. When I went to field dress her, she was FULL of blood. She had lost quite a bit, but it had all stayed inside her. All in all, even with me jumping her up, she only went maybe 60-70 yds total from where I had shot at. The hard thing was just searching around with the crappy lights I had. I've got a big battery powered spotlight at the house. Guess I'm going to have to start leaving that thing in the truck next year. Hopefully though, I won't need it. 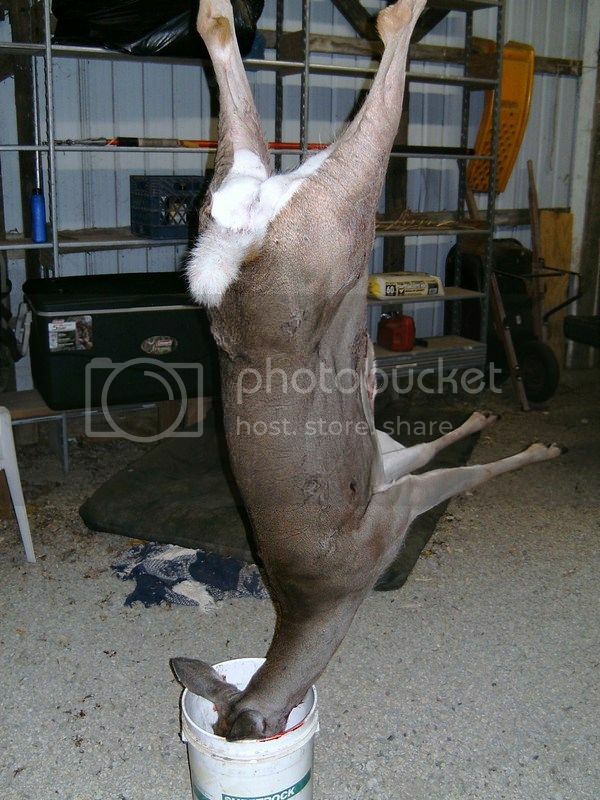 You're puttin the hurt on that doe population! In KY, we're only allowed 1 "antlered" deer a year. The statewide tags you get have 2 tags, which can be used on 2 antlerless deer or 1 antlered and 1 antlerless. I also got a Bonus Antlerless permit that is good for 2 does. All totaled, I got the 8pt and the 2 does. I've got 1 antlerless tag left, but I don't think I'll use it. I know there's more does down there than what I've been getting pictures of, but I just don't feel comfortable taking any more. Some areas of KY, you can take an UNLIMITED number of antlerless deer. Just keep buying the tags ($15 for 2 tags) and you can keep getting them. The KDFWR had my county zoned as a Zone 1 County with unlimited doe harvest for a few years, even though it really didn't need to be. We kept griping to them about it, saying that it didn't need to be Zone 1 and couldn't sustain that level of harvest, but they didn't listen. Finally, it backfired on them. We had a really bad die off one year because of EHD and that, combined with the excess doe harvest in the past flat decimated the population. The next year, they had us as a Zone 2 county (4 deer total). The next year we were a Zone 3 county (4 deer total, but only 2 with a gun). There's only 4 zone numbers in the state with Zone 4 being the most restrictive (fewer gun season days and more restrictions on antlerless harvest). The population is starting to come back, but still not anywhere near where it should be. I figure with what I've been seeing on the cameras, 2 does aren't going to hurt the population. Yep on the two does not hurting the population. KY DNR is like a lot of state DNR decision makers, far off the mark. The same type of decisions have crippled some hunting here in Iowa. I reckon some squirrels are in your plans now, huh?